Victory is not what it seems. A whole new world he never knew existed forces Eron to make the most difficult decision in his life: Join the barbaric Anastasian Defense Force and fight the Forgotten, or side with Timo and the creatures he was raised to hate. His decision will change the course of Anastasian life. Time is short. The future is now. The Forgotten will rise. Don’t miss this thrilling second book in the Forgotten Chronicles Trilogy, and continue the adventure today! With good character development and a great narrator this is a entertaining read. For fans of this genre it is a different variant of similar works in Film and T.V. Listeners will enjoy the plot twists and adventure of this series. At first I was confused because I didn’t read the first book (didn’t realize it was part of a series). Eventually it started to come together. Good writing. Really loved the grim world and characters. I would recommend listening to the first book for a better understanding. With the abrupt ending of the first book, I was really hoping this book would pick up where the first ended and start answering some of my unanswered questions. I was not disappointed because this book picks right up where the last one ends. The narration is good and the pacing and action keep things interesting. If you liked book 1, you should definitely go for this book and continue the story. This is a nice sequel to The Selection, which was book 1 of The Forgotten Chronicles. It answers some questions and continues the story pretty much where it ended in The Selection. The style of writing and plot development is pretty consistent with the first part. I did like this second book better than the first because it had more characters who had their own story line, which offered some nice variations. I had the same issues as with book 1 (I refer you to my review of The Selection for those), including the narration, but when I encountered the same frustrations consistently, I decided to listen to it as if it were aimed at young teenagers. And that helped a lot, since now all of my issues were explained by it being aimed at that kind of audience. So, if you're a 10-12 year old, or if you are a parent of one, this is a nice youth sci fi novel. Not much younger than that though, since there are some (very modest) references and hints to sexual behavior, and there is some violence that is mild for adult readers but not for children. All in all a nice children's/young teen's book - and therefore in my (very humble) opinion not very accomodating to adult readers/listeners. - I was given this free review copy audiobook at my request and have voluntarily left this review. I was not required to write a positive review and this reflects my honest opinion of the work. This book was given to me for free at my request and I am providing this voluntary review. As a note, I have not listened to the first book in the series, so bear that in mind when reading this review. I quite enjoyed this book, despite having not listened to the first in the series. In fact, I found myself enjoying the process of mentally piecing together the events that occurred in the first book. Approaching the book with this perspective, I found that the book stood well on its own. The narrator was very easy to understand. The narrator's accent added to the overall enjoyment of the book, in my opinion. Overall, I enjoyed the plot of the book. Though, I have to admit that up until the last 3 minutes of the book, I felt almost certain that the story was going to end on a cliffhanger. I was dead wrong and the ending left me with a smile on my face. In several parts of the book, it became more and more clear to me how deadly the planet in and of itself is to the inhabitants, regardless of factions. Despite the more dire threat of extinction for the Truth, all of the main characters struggled to some extent individually to survive against the creatures (and weather) of the planet. The book did drag in a few parts, with some loose plot strings at the end, but as a whole I found it to be a good listen. I recieved this book free of charge for an honest review. I didn't really care for this, I got the impression it was a secret underground world, enlightened upperworld type book. what I got out of it was a game of cowboys and Indians on a different world with aspects of espionage and government lotteries. it wasnt a bad idea honestly I just not my thing, and would probably be easier to get into on paper. The forgotten are humans that are effected by the planet.. it is a cool idea. The selection to reduce population, the wealthy and affluent main city, the derelict and starving communities- kinda reminiscent of Hunger Games. Despite this it is still a refreshing story. I need to read /listen to the previous book. It took me a while to catch on to a few things since I’ve not listened to previous one. Soon, it was not a hinderance. There are still gaps that hopefully book 3 will fill in. This is definitely not a stand-alone. This is the first book I’ve read/listened to by this author and I would listen to another. I like the world the author created. This is the third book I’ve listened to by this narrator and I would listen to another. He use different voices for the character including accents. Some are similar in tone but it did not create a problem for me. I thought they were well done. This book nicely continues where book 1 left off and gets right to the chase in filling in the missing details and teased information book 1 leaves you with. Again, there are a lot of unanswered questions but you also learn a lot as the world the story takes place in vastly expands from book 1. I am definitely interested in learning more! For some reason it was a bit harder for me to get into this time but I still found the listen interesting and am looking forward to see where book 3 takes it. I think this may be due to some of the dialog feeling a bit forced or missing detail I was expecting. Overall though It was a fun listen and you definitely need to give it a listen if you enjoyed book 1. Narration was pleasant with a nice pace and tone but for some reason the 'whisper' voicing bothered me a bit during this listen. What I mean by this is that some characters (not all) were voiced in a way that made it sound like they were whispering their dialog at a normal volume. Overall though great narration. This book picks things up right where the previous one left off and manages to take the series far further forward than the initial one with the hunger games style trial being put to one side upon completion as the main character ventures into a very different world than the one he was used to growing up. It is interesting that the author seems to have managed to do a better job at introducing and fleshing out characters while far more stuff is happening around them than he did in the previous book, which was a more personal tale with the main focus being on Eron's journey, but even with having to cover more characters of note I also found Eron's development to be better in this book too. The narrator again provided a strong performance and helped to enhance the overall enjoyment of this book in doing so. Overall, a strong second installment in this series that built on the first one while changing quite drastically in scope. Don't be fooled by the apparent simplicity of the main players of this story and their gentle outlook. This is a tale of fear and chaos, broken lives, wild beasts, terror, love and racial discrimination. And war. Continuing where Book I ended, after the Selection, the two brothers go their separate ways, Timmi (now Nagi) back underground to his City, Freedom, and family there, and the younger Eron to the new thrills of Beta Prime, a city unlike any he has seen before, to a new apartment and wife. But the ruling Queen has decided that it is time to rid the planet of the animals living in the below ground tunnels and sends in her troops. Except the fur covered beings are as human as the Overlanders - and one of them is Eron's brother. The narration by English accented Paul Jenkins is clear, with good expression and individually voiced protagonists. His pace is matched to the text and carries the story forward well. A good delivery. 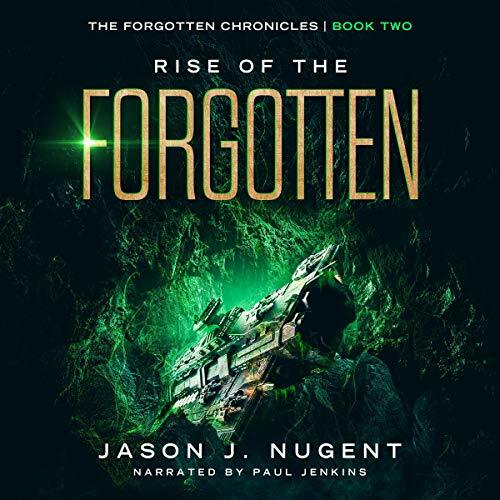 Rise of the Forgotten is an exciting, full action story with vibrant imagery and a large cast of characters, which illustrates the cruelty that comes with ignorance, confusion, misunderstanding and corruption from above as well as courage, love and family bonds. My thanks to the rights holder who, at my request, freely gifted me a complimentary copy, via Audiobook Boom. An excellent young person's read.